For budget-conscious college students, spring break often entails cramming people into an inexpensive hotel room (and sometimes sleeping on the floor), drinking cheap beer, and partying the week away. But you don't have to spend your precious week living like a frat boy. Students with limited spring break bankrolls can enjoy a classy trip to Las Vegas. Even without all the frills, good eats, a comfortable bed, and poolside lounging await you, so that you can return to your studies relaxed and ready to learn. Hey, it's Las Vegas! So, while the evening festivities include clubs and bars, the afternoon is meant to be enjoyed, cabana-style, at the pool. And, true—the nice pools in Vegas usually come with an expensive price tag. 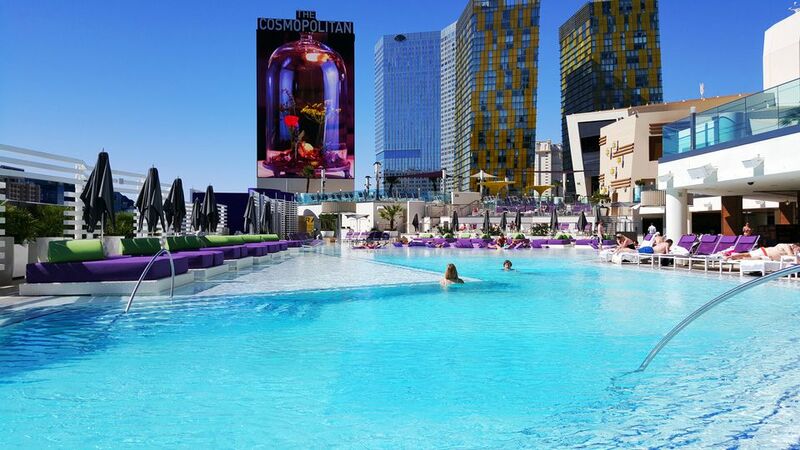 But for an exciting wave pool at the Mandalay Bay or the relaxing waterfalls at the MGM Grand, it's certainly worth the splurge on your room. Budget vacationers still have stellar options, however. Check out the Tropicana with swim-up blackjack tables and a reverse happy hour menu. (Yes, happy hour deals in the morning!) The pool itself is huge and full of budget-minded college coeds nearly every week in March. With three saltwater pools located on the property, Circus Circus (and their extremely inexpensive spring break packages) is also a great budget pick. The key to maintaining your spring break stamina is a quality morning meal. And since money is an issue, this is your chance to pack in your daily calorie intake, while indulging in fresh fruit and protein-packed buffet options. If you’re staying at a nice hotel, however, don't fool yourself by thinking the buffet is in your budget. While the finer hotels will have healthy gourmet options, the buffet will, quite frankly, set you back. Ask for a meal coupon when you check in or attend one of the less expensive buffet options like the breakfast at Circus Circus, the Excalibur , or the Golden Nugget. The food courts in Vegas—unlike the one at your local mall—can be chock full of both healthy and gourmet options at a reasonable price. New York, New York's Village Street Eateries simulates a stroll through Greenwich Village and offers a New York-style pizza joint, deli, street-side hot dog stand, and fish and chips spot. Sample one eatery each day for an economical meal. Similarly, the MGM Grand's food court features fast-casual restaurants serving up Chinese food and Coney Island hot dogs. Pop into the Fashion Show Mall to eat (not to shop) and select from hometown fast-food joints like Subway, Jamba Juice, and Great Wraps. And if food courts aren't your thing, the Cheesecake Factory at Caesar’s Palace and Regale Italian Eatery at the Excalibur offer great prices and large portions on sit-down meals. Las Vegas nightlife can get expensive. So, before you head out on the strip, make a plan. Research bars and nightclubs with little to no cover charge and opt for playing the slots over sitting down at a card or craps table. Most casinos offer free drinks, as long as you're gambling, but bring cash to tip the waitstaff. Carnival Court at Harrah's offers a street-side party experience with live bands, good drink prices, and fun bartenders. When others head to the Strip and flashy after-hours clubs, kick it old-school style instead at the Peppermill Fireside Lounge. One of Vegas' original (and secret) hotspots, the Peppermill offers 64-ounce signature Scorpion cocktails (only one will do you) and their booths surround a crackling fire for a homey hangout, void of the noise and fuss.